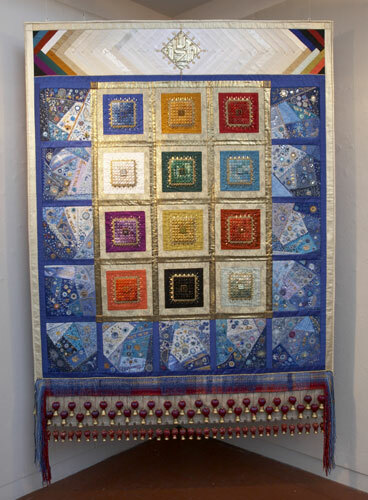 Designed by fabric artist Haya Nativ, the wall hanging Bigdei HaKohen HaGadol (the vestments of the High Priest) is a mosaic of colourful fabrics, threads, and stones, an interpretation of the words from Exodus, which describe the sacred vestments of the priests officiating in the sanctuary. The hanging contains twenty-five squares, recognizing the 25th anniversary of the Pomegranate Guild. The various elements of the hanging represent the various parts of the High Priest’s garments including the alternating bells and pomegranates, which gave the Pomegranate Guild its name.